Do you know what to do in an emergency? From having family supplies such as water, food, batteries, first aid kit, medications, can opener, etc. to having a plan, there are steps you can take to be prepared. In the event of an emergency, City of Lynn updates and shelter information will be issued through the City of Lynn website at http://www.lynnma.gov. You can also get City of Lynn updates by connecting through Mayor McGee's Facebook page and the Lynn City Hall Twitter page. Massachusetts has established a non-emergency help and information line that you can call by dialing 2-1-1. Please bring your Health Insurance Card if you have health insurance. All are welcome to receive a vaccination at no cost. Flu is a disease of the body's breathing system, including the nose, throat and lungs. The most common symptoms are fever, cough, and sore throat. Symptoms last from a few days to a week or more. These colorful posters and brochures detail the four best ways to stay healthy this flu season by lowering your chances of getting or spreading the flu. Everyone 6 months of age and older should be vaccinated for flu. The only exceptions are people with a severe allergy to eggs or to a vaccine component. 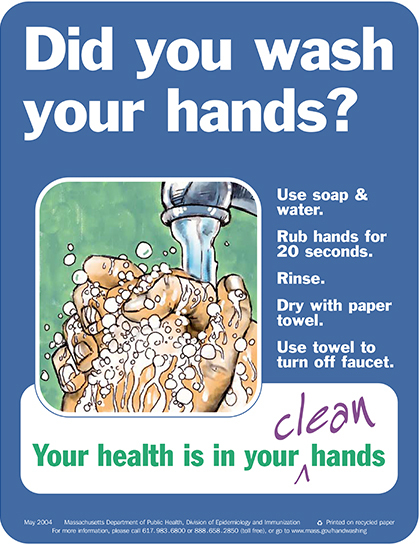 Washing your hands often, and coughing and sneezing into a tissue or into the inside your elbow, will also help keep you and others healthy. Booklets with useful instructions about taking care of people with the flu at home can be viewed online. For up-to-date flu information and where to find a flu shot, please call the MDPH Information Line toll free at (866) 627-7968 or visit their website. Additional information and helpful resources can be found on the CDC website. Evacuation may be necessary during a hurricane or tropical storm due to risk of storm surge. Storm surge is an abnormal rise of water generated by a storm, over and above the predicted astronomical tide. The destructive power of storm surge and large battering waves is often the greatest threat to life and property during a storm, and can result in loss of life, destroyed buildings, beach and dune erosion, and road and bridge damage along the coast. If you live, work, or plan to vacation in one of Massachusetts’s coastal communities, or near a river or other waterway connected to the ocean, you should "Know Your Zone." View the interactive map here or the evacuation zone maps for your community to learn whether your home or business is in a pre- designated hurricane evacuation zone. Heat Stroke is the most serious heat-related illness. When the body is unable to control its temperature, the temperature rises rapidly and the body is unable to sweat and cool down. This can occur rapidly, within 10 -15 minutes, with body temperature rising to 106 degrees F.
Please limit activities during very hot weather. Also, drink plenty of water regularly and often even if you don’t feel thirsty. Avoid beverages that contain caffeine or alcohol. Additional measures to beat the heat include taking cool showers or baths, and wearing loose, light-colored clothing. Avoid cooking and eat well-balanced, light, regular meals. If you do not have air conditioning, stay on your lowest floor, out of sun. Electric fans do not cool the air, but they do evaporate perspiration, which cools your body. Never leave children or pets alone in a closed vehicle. Please check on family, friends and neighbors. Heat Exhaustion is a milder form of heat-related illness that can develop after several days of extreme heat and inadequate or unbalanced fluid intake. If you believe you, or anyone you are with, is experiencing a heat-related medical emergency, promptly call 911, and if possible, move to a cooler place. If you have questions regarding the cooling center or need more information on how to beat the heat please contact the Lynn Health Department at 781-598-4000. The two mosquito-borne illnesses commonly that threaten our local area and throughout the State include West Nile Virus (WNV) and Eastern Equine Encephalitis (EEE) and the threat level for both is moderate. EEE is spread to humans through the bite of an infected mosquito. Initial symptoms of EEE are fever (often 103º to 106ºF), stiff neck, headache, and lack of energy, and in severe cases can progress to confusion, disorientation, and coma. EEE is a serious disease in all ages and can even cause death. WNV can infect people of all ages and people over the age of 50 are at higher risk for severe disease. WNV is usually transmitted to humans through the bite of an infected mosquito. Most people infected with WNV will have no symptoms. When present, WNV symptoms tend to include fever and flu-like illness. In rare cases, more severe illness can occur. The number of West Nile Virus and EEE positive mosquitoes across the State may continue to be active well into the fall and risk for mosquito-borne illness will continue until the first hard frost in your area. Hard frosts occur when temperatures fall below 28 degrees for several hours. For more information visit the MA Public Health Department’s website at www.mass.gov/dph. Northeast Mosquito Control performs routine spraying each year. Targeted areas may not always be published since residents may call themselves to request this service from Northeast Mosquito Control. The vehicle that sprays is a white pickup truck with a piece of apparatus on the rear of the truck that sprays synthetic pyrethoids. Spraying will not be done in front of a property where people or pets are observed to be outdoors or where signage is displayed that declines spraying. If the immediate area of your home is being sprayed, keep windows closed and fans off during the time spraying occurs. Shut off air conditioners unless they have a setting for recirculating indoor air. In very hot weather, make sure you open the windows or turn fans and air conditioners back on soon after the spraying is completed in your immediate area. If you are not sure if your air conditioner can be set to recirculate indoor air, turn it off when spraying is occurring in your immediate area. Rinse any homegrown fruits and vegetables with water. Keep pets indoors when spraying is occurring in your immediate area. Pets that remain outdoors could be exposed to small amounts of synthetic pyrethoids, but would not be expected to experience adverse health effects from the spraying. There are many pesticide products (e.g., flea collars, pet shampoo, dips) containing pyrethoids that are used directly on pets to control ticks and insects. If skin or clothes or other items are exposed to the sprayed pesticide, wash with soap and water. If the spray gets in your eyes, immediately rinse them with water or eye drops, and call your doctor. Because pyrethoids breaks down quickly in sunlight and water, and considering dilution factors, no special precaution or waiting periods are recommended for outdoor swimming pools or beaches. What health impacts among the general population can be expected with the spraying of synthetic pyrethoids? Due to the very low concentrations of synthetic pyrethoids used to control mosquitoes during spraying, adverse health effects are not expected. Have studies been conducted on possible health effects following spraying for mosquito control? Yes. The U.S. Centers for Disease Control and Prevention (CDC) reported that when administered properly in a mosquito-control program, insecticides pose a low risk for acute, temporary health effects among persons in areas that are being sprayed and among workers handling and applying insecticides. West Nile Virus is a disease most commonly spread through the bite of an infected mosquito. Most people infected with WNV won’t have any symptoms and will recover on their own, but some may develop fever, headache, nausea, rash or more serious symptoms. Targeted spraying is not currently planned for the City of Lynn at this time. Please check back for future announcements of targeted spraying. The Mayor’s office and the Health Department would like to remind residents that the aim of spraying (if required) is to lower the overall mosquito population and reduce the numbers of infected mosquitos in the affected areas. Spraying reduces, but cannot completely eliminate infected Mosquitos. Therefore, it cannot eliminate the threat of mosquito-borne illness. That is why it is very important for all residents, regardless if they live in the affected area, to take personal precautions against mosquito bites. The City of Lynn has worked closely with the MA Department of Public Health and the Northeast Massachusetts Mosquito Control District throughout the season to reduce the risk of illness spread by mosquitoes. Mosquito pools are tested weekly from May to September in order to help identify infected mosquitoes. In addition pesticide treatment of catch basins (where mosquitoes lay their eggs) was performed throughout the City this summer. Information about WNV and reports of current and historical WNV activity in Massachusetts can be found on the MDPH website. You may also contact the Lynn Public Health Clinic at (781) 586-6837 for more information. See the next tab on the left for Property Exclusion From Pesticides which is a designation that must be made each year prior to March 1st. With the mosquito breeding season over for this year, we are already gearing up for the next season. Residents can exempt their property from pesticide application activities and in the past we did our best to accommodate all requests. Beginning in 2014, we were no longer be able to accommodate those requests that did not adhere to 333 CMR 13:00, due to a determination by the State’s legal department (please see attached regulation). This regulation remains in effect as written for the 2015 mosquito breeding season. We are informing residents early to insure that those who wish to exempt their property send their certified letter to the municipal clerk no later than the March 1 of the year they are requesting exemption. Designation for exclusion must be made prior to March 1st of each year and shall be effective from April 1st of that year through March 31st of the following year. Properties to be exempted will be entered into our data collection and mapping program. This program is designed to alert the applicator of an upcoming, exempted property allowing the sprayer to be turned off in an appropriate time frame. Properties included in the exemption layer of the mapping program are based on the actual parcel boundaries (according to the Mass GIS database) to allow for better exemption of the entire property. We are informing the local Boards of Health and Municipal Clerks early as this is a change from previous years when residents could call us directly to have their property exempted. As requests come in to the Clerk’s office, they may be forwarded directly to us, held until the March 1st deadline after which we will have a District representative pick them up or they may be included in one database to be sent to our office no later than March 5. The desires of the owner of the property will take precedence over those of a tenant according to 333 CMR 13:00. Please note: This form must be submitted by certified letter dated between January 1 and March 1, of the year the exclusion is requested, to the Town Clerk in the town in which the property exists. The exclusion will run from April 1 of that year to March 31 of the following year. Please feel free to contact our office if you have any questions, and please access our website at www.northeastmassmosquito.com for more information on the Northeast Massachusetts Mosquito Control and Wetlands Management District. Our telephone number is (978) 463-6630.